A natural gas furnace costs less to operate than an electric furnace. Although electric furnaces are super efficient, the cost of electricity can be very high. In fact, natural gas costs about 50% to 70% less than using electricity. In addition, a natural gas furnace is cheaper to maintain than other heating systems. They rarely break down, meaning you will save money on repair and replacement bills. However, problems do arise, so it is important to schedule regular maintenance to keep your natural gas furnace running for years to come. The burning of natural gas is clean and efficient. Natural gas is the most efficient fossil fuel that you can burn, and it produces the most heat. A new gas furnace can be up to 98% efficient, meaning that 98% of the fuel used by the furnace becomes heat for your home, with only 2% going to waste as exhaust. Why spend money on wasted fuel? Most new homes are built with ductwork, and many older homes already have a gas line and ductwork in place. This makes installing a new gas furnace easy and convenient. A trained HVAC technician can get your new gas furnace up and running, especially if your home is already equipped with gas hookups and ducts. If your home does not have ductwork, it can be installed. Of course, you hope your furnace provides you with heat. 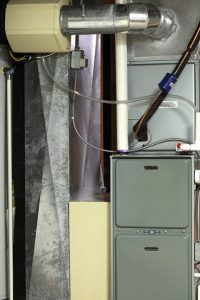 A natural gas furnace provides prompt heating around a home. With an electric furnace, it takes longer to heat a home because the coils have to first warm up. But natural gas combusts and begins to generate heat pretty much instantaneously. Then, it’s just a matter of distributing heated air throughout the house. A new natural gas furnace can be a great investment for your home. We know how important it is to stay warm and cozy during the winter, and if a natural gas furnace is right for your home, you will be comfortable in no time! Contact Bob Mims Heating & Air Conditioning today. Serving Staten Island’s Heating and A/C needs since 1955.